Post-Law & Order: Special Victims Unit, Christopher Meloni’s walks on his wild side include Fox’s short-lived but bracing Surviving Jack, a pair of Wet Hot American Summer followups and a stint as Donald Trump in Funny Or Die’s The Kellyanne Conway Story. 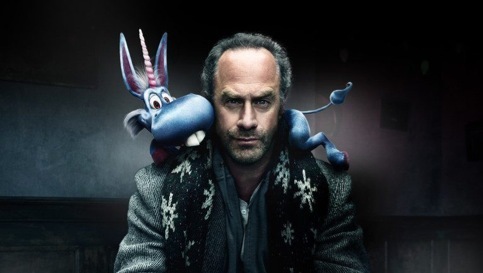 It turns out he was just warming up in the bullpen for the Syfy network’s Happy!, in which viewers are welcomed to “The Worst Christmas Ever.” First scene: Meloni’s beyond disheveled ex-cop, Nick Sax, coughs up blood in a filthy restroom housed in his favorite bar. This is just seconds before his head literally and continuously explodes in a fantasy dance sequence hatched by what’s left of his mind. “My life is an ever-swirling toilet that just won’t flush,” Nick says during Wednesday’s premiere episode. Self-awareness is key to any cure. Adapted from the same-named graphic novel by Grant Morrison and Darick Robertson, the eight-episode Happy! serves up heavy violence and random grins reminiscent of the Starz network’s Ash vs Evil Dead. But setting it during the Christmas season adds extra elements of extreme depravity via a deranged “Bad Santa” (Joseph C. Reitman) who makes Billy Bob Thornton’s version seem like a Keebler elf. His most recent kidnap victim, sweet little Hailey Hansen (Bryce Lorenzo), has an imaginary friend named Happy (voiced by Patton Oswalt). He’s a miniature, winged, moralistic blue horse who then seeks out Nick to rescue Hailey. Now a hitman, Nick dispatches assorted vermin with the greatest of ease. Still, there’s another far more personal reason for Happy picking him out of New York’s not-so-finest. You’ll probably see it coming because it’s a pretty shopworn means of slowly drilling down to the heart of an otherwise hollowed out miscreant. Syfy made the first two hours available for review, with the second episode including a metaphorical appearance by Nick on Jerry Springer. He’s still wearing a blood-soaked hospital gown after escaping the clutches of the demonic Smoothie (Patrick Fischler) and four of his goons. In a gangland subplot, Nick has come upon a password that would make its possessor all-powerful -- or something like that. Perhaps you’re expecting any of this to make much if any sense? The two other key characters are hard-boiled detective Meredith McCarthy (Lili Mirojnick), who used to have a thing for Sax, and Hailey’s extremely worried mom, Amanda (Medina Senghore). This easily is Syfy’s most “adult” series ever, with even a few f-bombs adorning the opening hour. The Bad Santa sequences alone might prove to be an understandable and deal-breaking turn-off to many potential viewers. Terrorizing little kids and encasing them in wooden boxes is not exactly Christmas-y. Happy! otherwise is recurrently a visual banquet of surreal scenes, with Meloni obviously not caring a whit about his “image” after a dozen years of true-blue crime solving on Law & Order: SVU. Actors are supposed to take chances, and this is a guy who’s willing and able. More power to him, even if Happy! overloads on shock value the way Hallmark annually overdoses on sappy holiday cheer. At one extreme, you want Santa dead. At the other, it can get to be ho ho hum in a hurry.